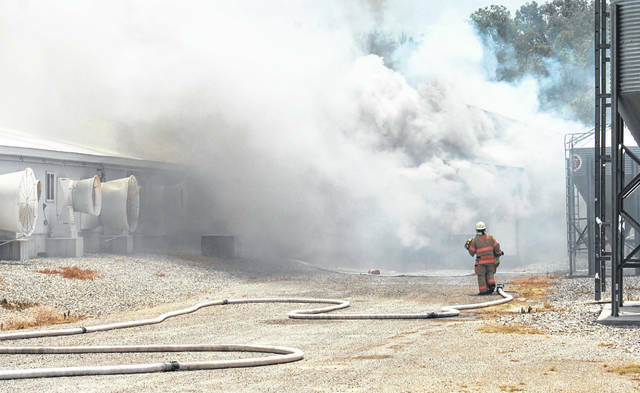 Several Fayette County agencies announced this week they are collaborating to keep the public informed regarding the cleanup process at the Straathof Swine Farm facility that was destroyed by fire June 19. These agencies, including Fayette County Public Health, Fayette County EMA and the county commissioners, released a press release stating they “are aware of the public’s concerns with the cleanup process” at the Wayne Township swine farm. Approximately 5,000 swine were killed during the June 19 fire. Authorities said crews are working seven days a week, including Wednesday’s July 4 holiday, in extreme heat and other adverse weather conditions to complete the cleanup in a timely manner. The cause and the origin of the fire are still under investigation, according to the Ohio Fire Marshal’s Office, and no foul play is suspected. Kelly Stincer, an Ohio Fire Marshal’s Office public information officer, said late last week that investigators hope to close the investigation in the next couple of weeks. Anyone with questions or concerns is asked to contact Jenny Coe or Leigh Cannon of Fayette County Public Health, Division of Environmental Health, at 740-333-3590.